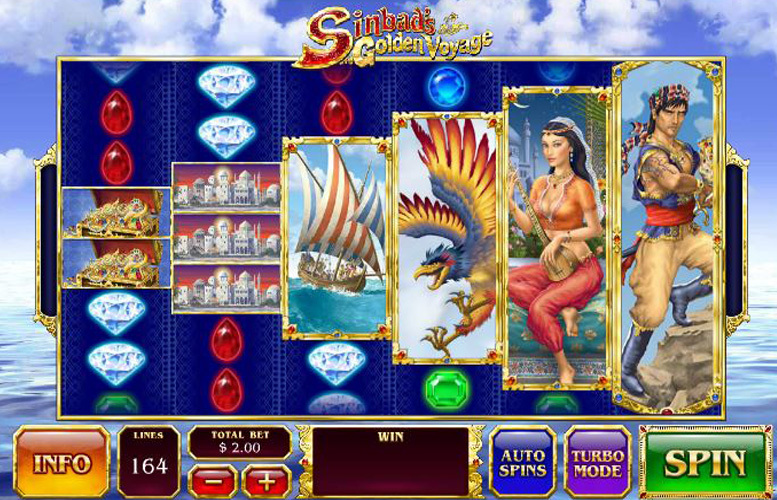 Sinbad’s Golden Voyage is a somewhat strange slot machine. Playtech have really worked hard to create an innovative game and as you’d expect from such a seasoned outfit, they pulled it off masterfully. The colourful seascape background and eye-catching symbols are certainly striking but they aren’t the first thing that get your attention when loading the game up. The board itself is. It consists of six reels and six rows – by no means the industry standard. Because of this interesting take on layout, the machine offers a sizeable 164 ways to win. Great for those who’re tired of the standard 5×3 slot experience and feel like mixing it up every so often. Vibrant, well-illustrated symbol and background artwork. The game’s a looker that’s for sure. Fantastic bonus features. The Leviathan Free Spin round highlights how blessed Playtech are in the creativity department and the “wild” Leviathan monster just looks awesome. Massive return to player rating. Tragically low prizes. They’re very frequent but fans of “go big or go home” style games will not enjoy Sinbad’s Golden Voyage. Low betting limits. For most recreational players, the £100 per spin cap will be more than sufficient. Some machines offer 20x this though, and there are certainly players who like to go that big. Princess = 7x the total bet. Mythical bird = 3x the total bet. Ship = 2x the total bet. We weren’t lying when we said they weren’t impressive! All symbols are stacked on the reels. On the first reel, symbols appear in stacks of two. On the second reel symbols appear in stacks of three. On each of the six reels, the number of symbols comprising each stack increases by one. This can of course lead to some truly massive wins, despite the low pay table structure. Landing the shield “scatter” symbols on reels two, four, and six simultaneously will trigger the Leviathan free spins. 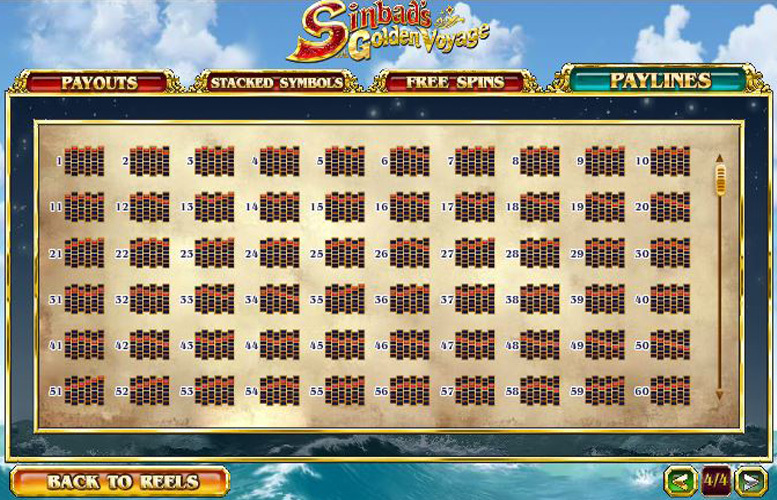 During the seven free spins, the stacks are all reversed. This means that on reel one, each symbol appears seven times in a stack. Of course, it’s much easier to match symbols across a win line if there’s a great block of them on the first reel. 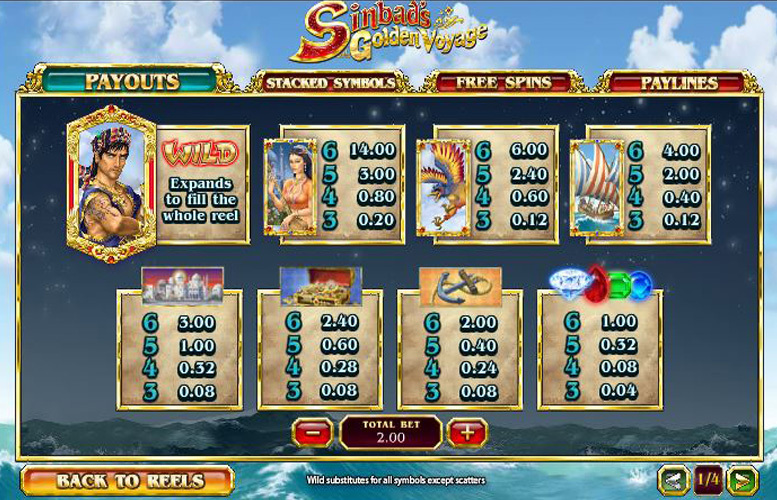 During both the main game and the free spins, if a Sinbad “wild” symbol appears on the reels he expands to cover the entire reel. This can significantly increase the number of win lines you’ll be paid for, depending on the symbols surround it. Palace = 1.5x the total bet. Treasure, or anchor = 1x the total bet. Jewels = 0.5x the total bet. As expected, this quirky slot has a non-standard betting structure too. There is only one option to vary bet size, as all 164 win lines are fixed. Players can choose between a minimum and maximum of 2p and £100 respectively. Clearly, Sinbad’s Golden Voyage is not for the highest rollers around. We really like this game. Understanding why the prizes must be so low it negates its only real criticism. Sinbad’s Golden Voyage looks fantastic, and it plays great. Even though it’s perfect for a change from the standard 5×3 slot machine format, it can easily hold its own against the best in the industry. If you could bet £1000+ per spin it would easily be a perfect score. This game has a rating of 5 / 5 with 467 total reviews by the users.